After two days of hearings, several members of an 11-member advisory panel of the U.S. Food and Drug Administration found that there are not yet sufficient data to determine that a genetic modification that enables salmon to grow twice as quickly is safe for the affected fish or for consumers. The panel, made up of outside experts, did not vote or make a recommendation on whether to approve these fish for human consumption, after holding today's public hearing to determine whether genetic engineering is safe for the fish; whether the fish are safe to eat; whether the fish actually do grow faster; and the potential environmental impacts the production of these fish could pose. AquaBounty Technologies, the company that hopes to get the modification approved, faced considerable criticism from a number of consumer and scientific advocacy organizations at the hearings. The genetically altered salmon eggs include a growth hormone gene that cause them to reach full size in about half the time it takes regular salmon to reach the same size. Ron Stotish, the CEO of AquaBounty Technologies, said after the hearing that the committee misinterpreted much of the data and got confused by the "enormous" amount of data presented to them during the hearing, which lasted more than eight hours. FDA Documents released before the hearings also indicated the fish are safe, and one FDA scientist testified to that earlier today. "In conclusion, all of the data and information we reviewed ... really drive us to the conclusion that AquAdvantage salmon is Atlantic salmon, and food from AquAdvantage salmon is as safe as food from other Atlantic salmon," said Kathleen Jones of the FDA's Center for Veterinary Medicine. But several of the technology's opponents attended the hearing to urge the FDA not to approve the eggs, accusing the FDA of relying on shoddy science when they did their initial review and determined the fish to be safe. "The FDA is relying on company data from only a handful of fish," said Wenonah Hauter, executive director of Food and Water Watch. "Such flimsy science isn't good enough to assure the public that this product is safe to eat. Donald Prater of the FDA's Center for Veterinary Medicine, visited AquaBounty Technologies and helped gather data for the agency's intiial review. He testified earlier today that the safety study included some fish that were selected based on certain characteristics, but said they were comparable to normal salmon in terms of health problems. He also said the fish would require additional monitoring to determine whether the growing conditions could cause additional health abnormalities. 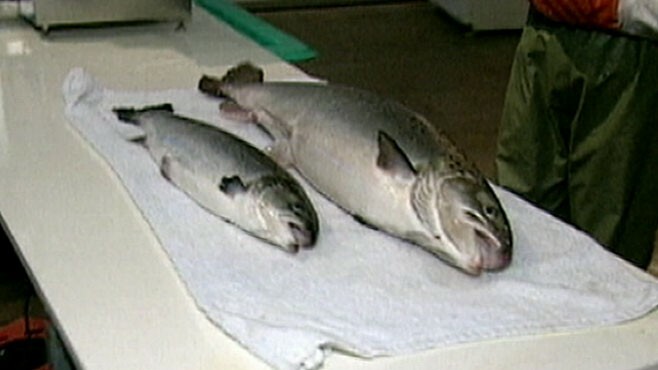 Other critics said these fish pose a threat to salmon in the wild. The Ocean Conservancy, a Washington, DC-based conservation organization which opposes the salmon production, said these fish could pose a huge risk to native salmon species if they were to escape from captivity. "This dangerous precedent could eventually allow genetically modified fish in the very same pens and cages where hundreds of thousands of fish escape every year," Anna Zivian, a senior manager with the Ocean Conservancy has said. Zivian testified before the FDA today. Representative Dennis Kucinich (D-OH), also weighed in on the issue, urging the FDA, in what he said was the interest of the safety of the public and the environment, to avoid "ram[ming] the decision through." Other scientists say the salmon may not pose an ecological risk after all. Yonathan Zohar of the University of Maryland's Center of Marine Biotechnology said as the human population increases, so will the consumption of seafood. In order to avoid overfishing and depleting wild fish, fish must be grown. He added that if it's done in fully-contained, land-based tanks, the effects can be positive for the ecosystem and for people's health. Eric Hallerman, a professor of fisheries and wildlife at Virginia Tech University, also spoke of the benefits these salmon can provide. "This may be good news for the environment," said Hallerman, adding that native populations are tapped out. But he stressed there must be very strict confinement of these fish so they can't escape into the wild. "If they interbreed with native salmon there could be loss of local adaptations and perhaps loss of those populations," he said. The FDA will hold its next public hearing tomorrow, as it considers whether to label the salmon as genetically modified, if it is ever approved. The FDA declined to set a timetable for making a final decision on the matter. ABC News' Lisa Stark, Brian Hartman and Andrew Miller contributed to this report.